CORNWALL, Ontario – With water temperatures well above the 10-year average, the St. Lawrence Seaway closed its 2015 navigation season ice free on Dec. 31. Thirty-six million tonnes of cargo transited the waterway during the season, with grain, at volumes well above the five-year average, leading the way. The Seaway once again proved to be a key asset for farmers as they shipped their crops to markets at home and overseas, the agency said. Grain volumes on the Seaway amounted to 10.8 million tonnes, one of the strongest years in recent memory. The Port of Thunder Bay, the principal point of entry for grain into the Great Lakes/Seaway System, reported its second-best season in 15 years. 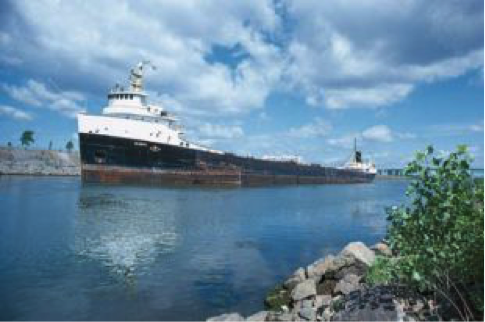 Combined with grain being loaded onto ships from other ports such as Hamilton, Duluth/Superior and Toledo, agricultural commodities have become increasingly important to the Great Lakes/Seaway System. “The Seaway continues to serve as a vital trade artery, enabling cargo to move to more than 50 countries across the globe,” said Terence Bowles, president and CEO of The St. Lawrence Seaway Management Corporation (SLSMC). The 2015 season opened on April 2, about a week later than usual, reflecting the frigid conditions in early spring, and closed Dec. 31 with the passage of the vessel Mississagi through Welland Canal Lock 1 at 3:41 a.m. The last vessel to exit the Montreal/Lake Ontario section was the Baie St. Paul, which exited the St. Lambert Lock at 8:41 p.m. Dec. 30. The 2015 navigation season was 274 days in length.